If you are looking for information on the The Human Bean Drive Thru franchise business opportunity, The Human Bean coffee franchises or The Human Bean franchising, then you have come to the right place. 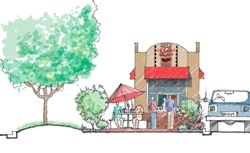 Franchisees can choose between our site-built or pre-fabricated 12'x36' building design. Total start-up costs vary by area. Site development fees, real-estate values, and the degree to which a site has been developed will determine the entry cost. Applicable engineering and permit fees also have a wide range of variability from region to region. In addition to the site specific development and real estate cost, hard costs also include expenses for building and building signage and dress, interior equipment, decking, menu boards, awnings, a freestanding pole or monument sign and the franchise fee. A few of the most important factors in a successful drive-thru are: 1) superior and consistent product, 2) being located on the predominant morning drive pattern with great visibility, 3) easy ingress and egress, 4) high traffic volumes (at least 15,000 cars per day), 5) friendly and effective staff. Many beginning and seasoned entrepreneurs find equipment leasing a valuable tool. Pre- fabricated drive-thru buildings are normally considered equipment. Often, the majority of the initial startup cost can be leased. Equipment leasing allows business owners to retain their cash, and saves them from the often-tedious experience of standard financial lending. 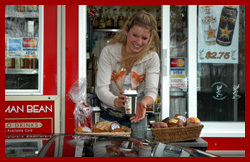 The Human Bean does not offer equipment leasing or financial lending, but helps in locating the same for potential franchisees. For your convenience we are listed on the SBA Franchise Registry.